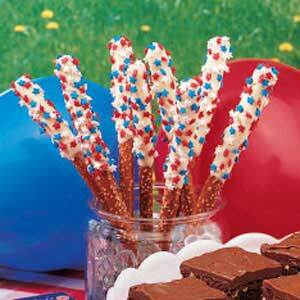 Here’s a fun snack idea for your 4th of July barbeque – Kids of all ages will enjoy these edible sparklers. Break white chocolate into a deep bowl or tall coffee mug. Melt chocolate in the microwave. Holding one end of the pretzel rod, dip the other end into white chocolate about 2/3rds of the way down. Sprinkle red, white and blue sprinkles over the wet chocolate. Invert to harden in a wax paper-lined cup. Keep pretzels cool in the fridge until ready to serve. 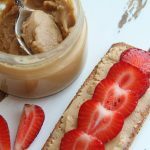 Here’s a fun snack idea for your 4th of July barbeque – or the perfect treat to pack in a cooler for that trip to the beach. Kids of all ages (and some grownups, too) will enjoy these edible sparklers.